Apartment with sea and mountain views! La Casetta di Morgana is a bright and airy apartment located on the second floor of a historic building in the quiet district of Mondello-Valdesi, 10 km from the center of Palermo and no more than 200 meters from the beach of Mondello, then in a few minutes walk you will be at sea! The area is widely served by public transport that will take you in 15 minutes directly to the historic center of Palermo and is less than half an hour from the airport Falcone-Borsellino (Punta Raisi). The internationally renowned beach, the presence of services and beaches, nautical clubs and countless sporting activities, places with traditional Sicilian cuisine and entertainment venues easily accessible on foot, are just some of the ingredients that will make your holiday in Mondello unforgettable. at the "Casetta di Morgana". 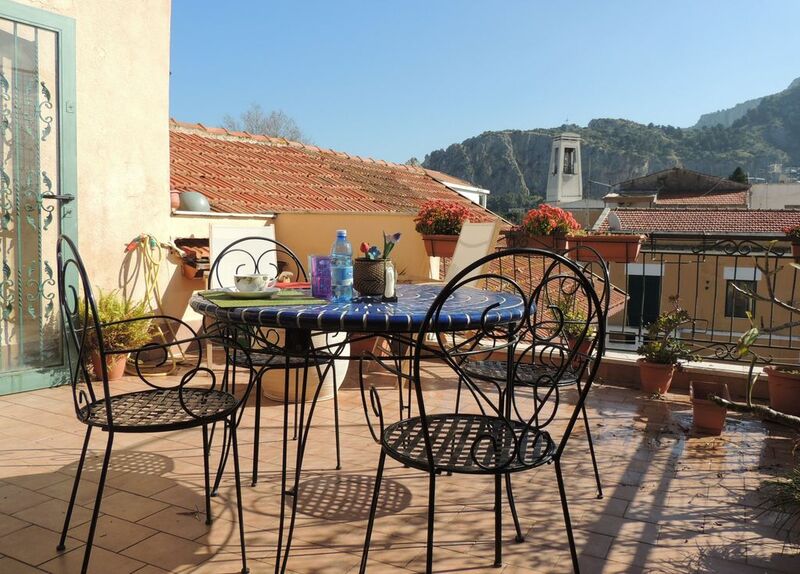 The strength of the apartment is the exclusive and large terrace where you can relax comfortably lying down or sitting at the table in the cool with a view of the beautiful mountain of Monte Pellegrino. La Casetta di Morgana is perfectly furnished and equipped with all comforts: a large double bedroom, a room with 2 beds, a more livable terrace and a spacious air-conditioned living room with sofa bed and TV and above all with three large windows from which you can enjoy a splendid view of the turquoise sea of ​​Mondello! All this could be ideal for a relaxing beach holiday and for a visit to the city of Palermo. In a few minutes, by a bus that will take you directly to the historic center of Palermo, you can go from the sea to the city and combine the fun of the beach with the knowledge of the Arab-Norman culture of the beautiful city of Palermo. Facilities of the House are: refrigerator, washing machine, dishwasher, kitchen with oven, TV, air conditioners, iron and ironing board, crockery and tableware, and WI-FI Internet connection. For your children you will find a cot, a playpen, a high chair and lots of beach toys. For any need or information the owner lives on the ground floor of the same building and I assure you that for her (ie for me) it will be a pleasure to meet you and be there in any way! Delightful property close to the sea and a short bus ride to the centre of Palermo. We loved the spacious flat with great views of the sea and the mountains and which enjoys a great balcony terrace. Lory was a charming, considerate host, who checked regularly to see that we had all we needed and gave us good tips for places to go. Thank you! Hope to see you again! Perfect location, beautiful apartment. Would stay forever if I could! You can't do anything about the weather and the resort/town is what it is - but the accommodation and the host can make or break a holiday. And Lori and House of Morgan made this a holiday to remember for all the right reasons. The house was brilliantly situated close to the beach, the bus route to Palermo and one of the best restaurants in Mondello - Alba. It had everything we needed and the terrace was a real bonus. Lori was on hand for airport shuttle runs and loads of brilliant advice about where to go, what to do and how to do it - even happy to walk us around the town on the first morning. A lovely relaxed holiday in a lovely apartment. Thank you Lori. We stayed in Mondello for two weeks in August 2016 and we liked this place very much. The sea is warm, nice and clean. The beach is sandy. The accommodation where we stayed was absolutely nice as well. It is located on the quiet street, 5 minutes walk from the Mondello beach. The sea view from the accommodation is astonishing. It has everything you need – fully equipped kitchen, wi-fi and air conditioning. Loredana is an excellent host. She is approachable and did everything she could to make our holiday unforgettable. Traditional, comfortable, great location & host. Our family stay began well when Loredana collected us at the airport which was just a 20 minute journey. The apartment was clean, comfortable, nicely decorated with added benefits such as a dishwasher, washing machine, views of the sea and lovely spacious terrace. The location was very suitable for our family as the beach was just a five minute walk with mini market and bakery nearby - the donuts are delicious!!! The area provided a great choice of restaurants and a safe and sandy beach with free or paid areas. ATM and Takeaway pizza were also nearby. Loredana & her family were wonderful, welcoming and informative hosts that made our holiday a true Sicilian experience. We would highly recommend this lovely property to all types of travellers looking for a safe and enjoyable holiday. Abbiamo trascorso un piacevole periodo di vacanza. Casa con una stupenda vista mare e con una freschissima terrazza vista montagna, dotata di tutte le comodità, compreso il barbecue. Loredana, la padrona di casa, ci ha accolto con la sua disponibilità, gentilezza e cordialità, consentendoci anche di goderci l'ultimo giorno di vacanza senza fretta e senza dover lasciare l'appartamento la mattina, visto che ci dovevamo imbarcare di sera, per rientrare a casa. Grazie Paola, e' stato un piacere avervi come ospiti. Spero che ci rivedremo! From our apartment you can enjoy the beach of Mondello without having to take the car. Everything is easily reachable in a few minutes. You can first go and have breakfast from a great bar near the house (we suggest you try the donuts) and then head to the beach or to the Capo Gallo nature reserve by taking the free shuttle. In the evening in Mondello you will find many local: from the most elegant restaurant to the trattoria, pizzerias, sandwich shops, bars where you can enjoy ice cream, pastries and sandwiches with panelle and crocchè. If you also want to enjoy the city of Palermo and its beautiful Arab-Norman route (and I highly recommend it!) a few steps from the house you will find the bus stop that leads directly into the city center passing by the park of the Favorita. But do not miss the tourist attractions at a short distance: the cathedral of Monreale, the city of Cefalù ... in short, we will advise you many outdoor activities and for sure you will not get bored!